Meat curries in UP mean mutton curries essentially in Hindu homes. Made spicy using home ground spices or whole spices sometimes, simmered in heavy bottomed pans for hours in leisurely times and pressure cooked when the meal needs to be quicker if not instant. But the flavors of the spices remain the same for most conservative food snobs of the state. They wont 'like' a mutton curry enough if it is not done 'their' way. I know because my dad is one of those snobs. And he was the one who used to cook mutton curry at home and later when I started eating meats, taught me as well. Spice blends are different in all Indian states and we immediately locate the origin of a dish by the whiff of the complex bouquet of spice blend used in a particular dish. All spices are Indian but they create a infinite range of combinations and permutations. Isn't that a wonderful thing to experience living in a country that is known for spices. Spice blends are like perfumery. The more robust spices are the base flavors and the delicate aromatic ones make the tasting notes that hit the palate first. The meats and vegetables add to the bouquet and we get a unique meal in every little home across the country. The homes where homemade spice blends are used I mean. Many packaged spice blends have made the curries taste similar in some homes though, still the amount of fats used, the additional seasoning makes a difference. So if you didn't pick up the MDH or Everest blends for mutton curry, trust me to get a nice home style mutton curry with this recipe. The addition of potatoes is mine as I have seen a few friends of mine loving potatoes in a mutton curry, and the husband loves them too. My dad would shrink his nose at the potatoes I know. Skip them if you don't want them. Note that the final taste of this mutton curry depends on the curry powder blend too which is homemade in my case. Try and powder the spices in the same ratio and combination when you are making a UP style curry. Ready made packed curry powders are different. Heat mustard oil in a wide and thick base kadhai. Tip in the cumin seeds and wait till they crackle. Add the chopped ginger and garlic, saving 1/2 tbsp ginger julienne for garnish and let them fry for 30 seconds. Add Tejpatta, whole red chilies broken and seeds removed, and then add the sliced onions immediately. Add 1/2 tsp salt (more to be added later) and fry the onion till browned well. *I added 4 cloves and one black cardamom at this step as well, the husband doen't like whole spices in his curries so I keep the whole spices minimal most of the times, You might like to add a stick of cinnamon too. The mutton will be added at this step, mix well with everything and keep turning the pieces to let them cook from all sides. This bhunoing process will go on for about 25 minutes on low flame so the mutton pieces keep browning slowly, absorbing the flavors of the ingredients. You might need to quench the dryness with a tbsp of water every now and then but keep the mixture dry all this while. Since the flame is low, you can do a few chores in the kitchen while the meat is cooking. If cooking in a pressure cooker, this bhunoing step will be minimised to 10 minutes. Add the cubed potatoes and the powdered spices along with 2 tbs of water so the powdered spices do not get burnt and aromatic oils get absorbed into the half cooked mutton pieces. Keep the flame low and keep bhunoing for about 10 minutes more. Add salt and about a cup of water, cover the kadhai with a well fitting lid and let it simmer for 20 minutes or till the mutton gets completely cooked, the meat should be ready to fall off the bone, but should not be already detached from the bone. If pressure cooking, just bhuno the spices and cook for another 20 minutes. Potatoes should not be added when pressure cooking as they disintegrate and interfere with the taste of the curry when pressure cooked. Adjust the consistency of the curry, add more water or dry up on higher flame if required. Check seasoning and adjust. Add the green coriander leaves and serve hot. The ginger julienne make a nice garnish, they taste great in the curry as well. As I told you, I am not too fond of the potatoes in this mutton curry, the husband loves them ans I add them sometimes just to add some carbs to the curry when required. They do not hamper the taste of the mutton curry if added in small amount. 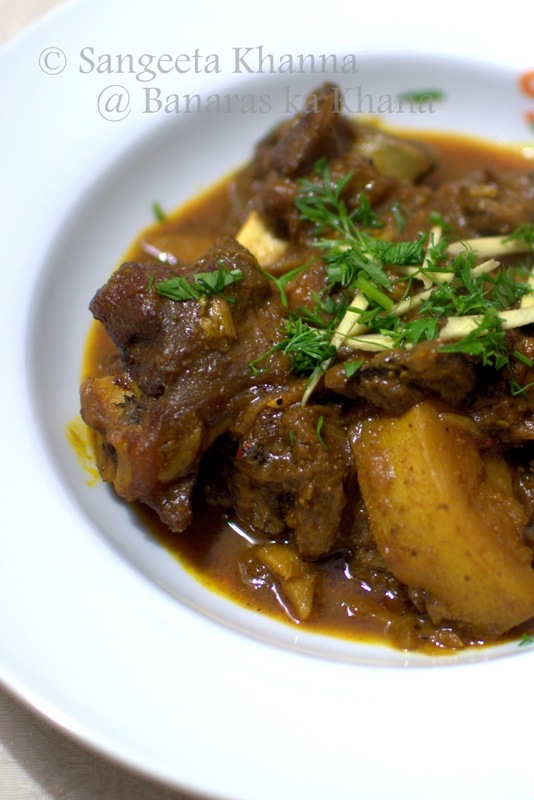 This is a robustly spicy mutton curry, you get the top notes of clove, green cardamon and cinnamon, tejpatta makes an appearance in the aromas as well. Browned onions and the black pepper, black cardamom and cumin make it robust and deep in flavors. 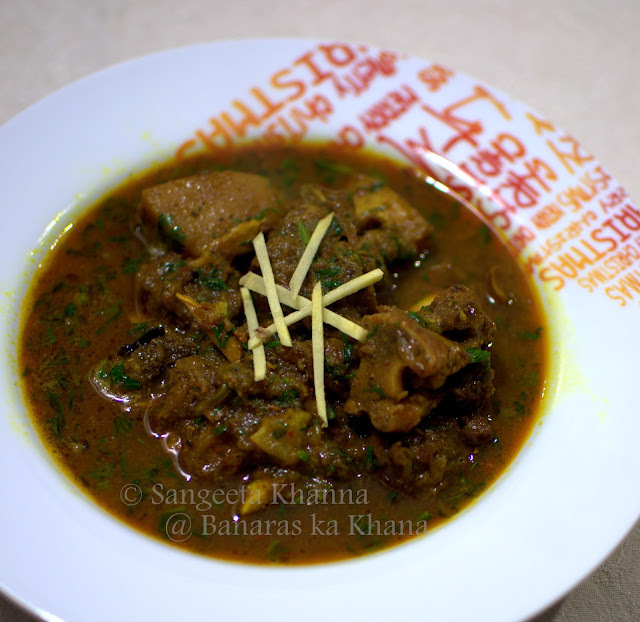 The spiciness of this mutton curry is deeply satisfying in a meal. You would feel like having more of the gravy and all your spice craving will be sated once you have it. Just don't load up your plate with too much roti or rice as it would make you feel heavy and dull after the meal. 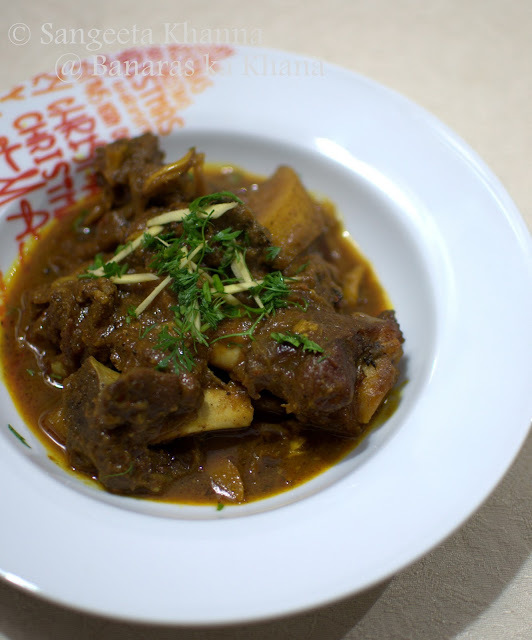 Another UP home style mutton curry is made in a different way. First boiling the mutton and making a yakhni, then bhunoing the boiled mutton with spices and proceeding to simmer the curry with spices. I have posted this mutton curry in the post where spice powders and their therapeutic uses are discussed. It is long post and you would have to scroll down to find that mutton curry at the bottom. Drooling Drooling and drooling Sangeetha! Wow Himanshu, you are such sweetheart. I know how perfectly you must have cooked it. So glad you loved this taste. Hope you will be at your best! Also I salute you for your love and respect you show towards your husband. If I could have a sister she would have been like you.